A paper purporting to be General Orders, No. 11, issued by you December 17, has been presented here. By its terms, it expells all Jews from your department. If such an order has been issued, it will be immediately revoked. In the name of hundreds who have been driven from their houses ... of the thousands of our Brethren ... who have died ... for the Union ... of religious liberty, of justice and humanity. 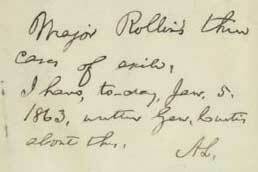 On the envelope in which the protest came, Lincoln writes "I have today, Jan. 5, 1863, written Gen. Curtis about this. A.L." The order was forthwith rescinded. United Order "Bne B'rith" to Abraham Lincoln, January 5, 1863. Manuscript Division, Papers of Abraham Lincoln. In the meantime the hue and cry had been raised, and delegations descended upon Washington. Editorials appeared in newspapers of the major cities, most of them attacking but some also defending Order No. 11. Jewish periodicals inveighed against the order, and two national Jewish organizations sent formal memoranda of protest. Both are in the Lincoln Papers and, hitherto not having been published, deserve quotation in toto. An Order, Expelling and Ostracising all Jews as a class has been issued by Maj. Genl U. S. Grant and has been enforced at Holly Springs, Trenton, Corinth, Paducah, Jackson and other places. In the name of the class of loyal citizens of these U.S. which we in part represent. In the name of hundreds, who have been driven from their houses, deprived of their liberty and injured in their property without having violated any law or regulation. In the name of the thousands of our Brethren and our children who have died and are now willingly sacrificing their lives and fortunes for the Union and the suppression of this rebellion. In the name of religious liberty, of justice and humanity-we Enter our solemn Protest against this Order, and ask of you  the Defender and Protector of the Constitution  to annull that Order and protect the liberties even of your humblest constituents. The set of Resolutions adopted by the Board of Delegates of American Israelites at a special meeting of its Executive Committee in New York on January 8, 1863, Henry 1. Hart, Esq., presiding, is longer and stronger. Be it therefore Resolved that we have heard with surprise and indignation intelligence that in this present Century and in this land of freedom and equality an Officer of the United States should have promulgated an order worthy of despotic Europe in the dark ages of the World's history. Resolved that in behalf of the Israelites of the United States, we enter our firm and determined protest against this illegal unjust and tyrannical mandate depriving American Citizens of the Jewish faith of their precious rights, driving them because of their religious profession, from their business and homes by the military authority and in pursuance of an inequitable prescription. Resolved that the Israelites of the United States expect no more and will be content with no less than equal privileges with their fellow Citizens, in the enjoyment of "life, liberty and the pursuit of happiness" as guaranteed by the Constitution of this Republic. Resolved that it is peculiarly painful to the Israelites of the United States, who have freely tendered their blood and treasure in defence of the Union they love, to observe this uncalled for and inequitable discrimination against them. Claiming to be second to no class of Citizens in support of the Constitutional government, they regard with sadness and indignation this contumely upon the Jewish name, this insult to them as a community, on the ostensible ground that individuals supposed to be Jews have violated "regulations of trade established by the Treasury Department and Department Orders." Resolved that it is in the highest degree obnoxious to them, as it must be to all fair minded American Citizens, for the general body to be made accountable for acts of particular persons supposed to belong to their denomination, but as has been frequently demonstrated, in many cases really professing other creeds. That if an individual be guilty of an infraction of discipline or offence against military law or treasury regulations, punishment should be visited upon him alone, and the religious community to which he is presumed to be attached, should not be subjected to insult, obloquy or disregard of its consitutional rights as a penalty for individual offences. 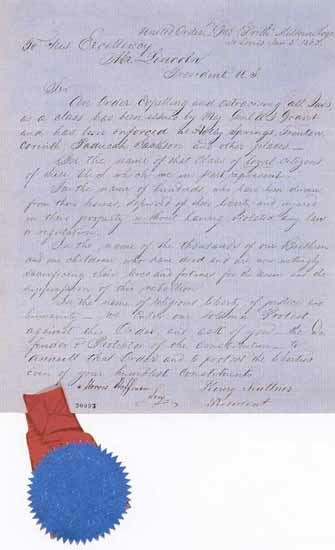 Resolved that the thanks of this Committee and of the Israelites of the United States be and they are hereby tendered to Major General H. W. Halleck, General in Chief U. S. A. for the promptness with which he revoked General Grant's unjust and outrageous order, as soon as it was brought to his attention. Resolved that a copy of these resolutions duly attested, be transmitted to the President of the United States, the Secretary of War, Major General Halleck and Major General Grant and that the same be communicated to the press for publication. The outrage of American Jewry against General U. S. Grant's Order No. 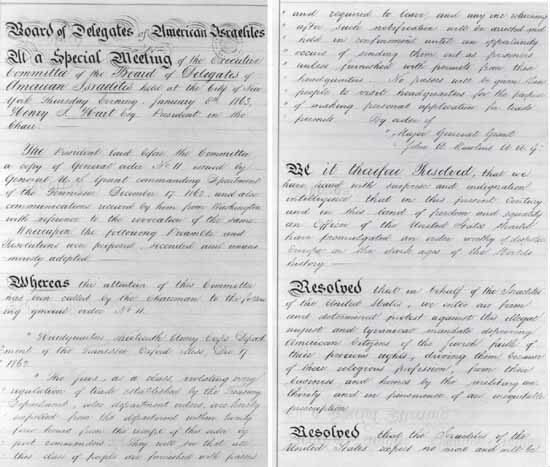 11, which expels the "Jews as a class" from territories under the Thirteenth Army Corps, is conveyed to President Lincoln by this set of calligraphically inscribed Resolutions, adopted January 8, 1863. Board of Delegates ... to Abraham Lincoln, January 8, 1863. Manuscript Division, Papers of Abraham Lincoln.